Every so often a book comes along that is so desirable that you just have to have it. When I was first shown ‘Snowdrops’ by Gunter Waldorf that was one such moment. Although it is small in stature, it has such presence, and such an arresting cover image, that your imagination is captured even before you open it. Over the years I have experienced the passion and enthusiasm of galanthophiles. Yes I have known about snowdrops since I was a child. I remember a clump of these delicate green and white beauties emerging in late winter from a gap between the stones in the sunken rock garden at the front of our house. The buds were pointed, like little green and white penguins, before the pendent blooms emerged. I think gardens then either had them, or they didn’t, they were not plants that you went out and bought. When I had my first country garden I wanted snowdrops. The front garden was shady and the soil quite heavy, the old brick cottage seemed to demand them. I bought bunches of snowdrops in the green from a local greengrocers, where they were displayed wilting in a wooden box on the pavement outside. The bunches of snowdrop bulbs, with the remains of flowers and limp leaves, were wrapped in pieces of newspaper. Gradually over the years the colony grew and they were a feature of every February. A few were picked by the children for the little glass snowdrop vase that sat dusty on the windowsill until snowdrop time came. When I started to do more talks and lectures to gardening clubs and horticultural societies I got to know quite a few galanthophiles, mainly through the Hardy Plant Society. At meetings, single snowdrop plants, grown in pots, were displayed for all to admire on the tables in village halls. Variety names were quoted by proud owners. Snowdrop forays were excitedly planned to gardens of other galanthophiles. The camaraderie amongst them was enviable, and I felt a bit of an outsider. They could obviously see the subtle differences between snowdrop varieties, while I was struggling; they were all snowdrops to me, or were they? I really liked the simplicity of the single snowdrop. I liked the petals to have that elegant curve. I liked the skirt to be visibly laced with green and I liked slender leaves. I suppose I was starting to look at them a little more closely. 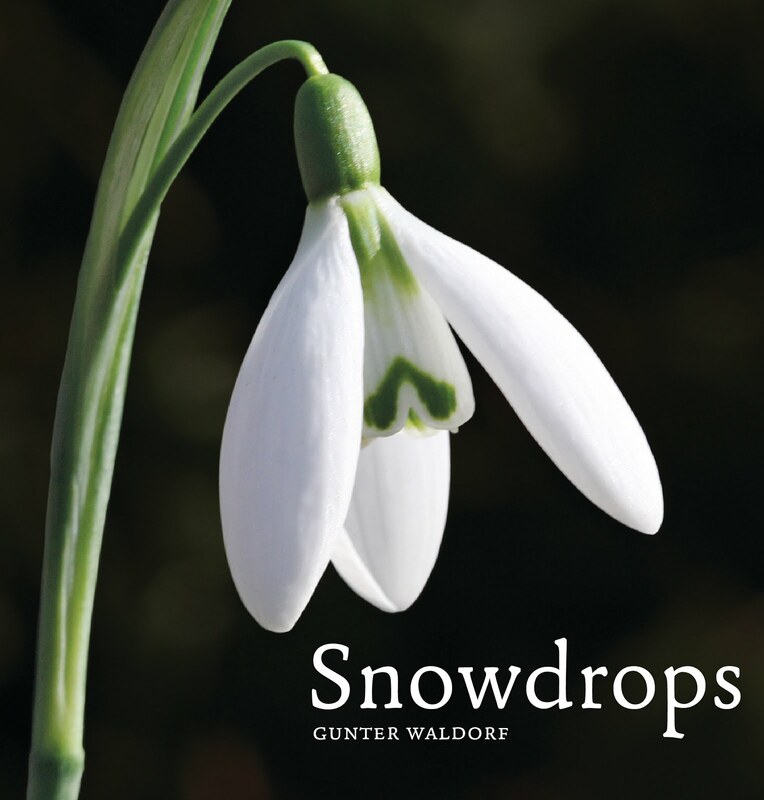 Whether you are like me, you love snowdrops in your broad garden palette, or you are a dedicated galanthophile you will adore this new book: Snowdrops by Gunter Waldorf. This little gem is a treasure trove of glorious portraits of probably every variety in cultivation, including yet un-named ones. It shows the subtle differences to perfection and describes them concisely. 300 varieties are photographed, and best of all in their natural setting. The book tells you all you need to know about growing snowdrops, planting snowdrops, acquiring snowdrops, collecting snowdrops and propagating snowdrops. It also lists sources of supply and gardens famous for their snowdrops in the U.K. You can both be enthralled and amused by it, or you can become bewitched by it and become a galanthophile. For existing galanthophiles it is pure indulgence written by one of you; perhaps I want to say one of us? I rarely read novels, and although I’ve written a few I’m not often drawn to books. However this has that magical fascination that I’ve found in certain books about plants and gardening over the years. I know I shall still be revisiting its pages when I’m too old to bend low enough to admire these little beauties in the flesh. In hardback it measures 170 x 170 mm and has 160 pages with over 300 glorious photographs.